This ancient track will lead us all along the Saronic Islands, where we navigate through hilly islands, turquoise coves and might possibly spot some Dolphins! We discover ancient places with Greek temples, wild bays where we anchor overnight and snorkel first thing in the morning. We fill evenings by strolling in little towns and villages where we dine on freshly caught seafood having our tables out in the cobblestone streets that have seen thousands of years of history already. As we are starting and finishing our travel in Athens, there is a possibility to further expand these Saronic Islands sailing holidays by visiting the birthplace of many famous philosophers and thinkers! Note: We are faithful to the true sailing spirit, therefore we plan exact stopovers together with the wind and weather. Our trips are not a planned itinerary which is always the same. This means that the exact order of stopovers may be different to the one presented below, but definitely as much interesting! In our opinion, that fact only makes these holidays more enjoyable! We start our sailing adventure nearby a cradle of philosophy and democracy. Arrival is easy as our marina, Marina Alimos in Kalamaki is situated only 45minutes from the airport and you can reach it by taking only one bus. The marina is a bit out of town, so if you want to take time to discover this great multi faceted city, please do arrive a day of two earlier. We plan to provision the yacht, meet the crew and leave the marina as early as possible to sail into the wild already on check-in day! On the easterns side of Aegina island we stop in a cute little bay. From there it`s a 30 minutes walk up the hill to the Temple of Aphaea which for already 2500 years is overlooking the island. It feels like travelling back to the time of ancient Greece. On the way down we stop to eat in a local restaurant and enjoy the shade. This evening we spend unwinding, getting into the sailing mode and getting to know each other from our crew. Hydra is a real magic. Tiny, tiny port offers shelter not for many yachts so we arrive here early. And that gives us time to really enjoy ourselves. We spend our afternoon with a walk in the cobble streets, great food with stunning view in a Sunset Bar and one of the best sunsets in Greece! The city has almost an intimate feeling. Just try going through streets full of flower pots, little coffee places, and pine forests all around. It`s definitely a highlight of the trip! 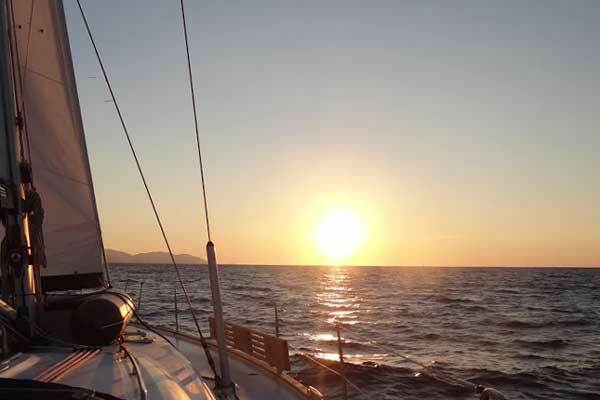 That will be one of your long-lasting memories from sailing in Greece! Because there is a ban on wheeled vehicles all the transportation is done with donkeys! For the ones who are up for a hike Mount Eros is awaiting to be conquered! It is only 590m high and the views from the peak are breathtaking. There is also nice fields, gardens and some semi wild horses to admire along the way! By anchoring in Palaia Epidavros, beautiful little village set in lush surroundings we gain not only a beautiful mooring spot, but also an access to an ancient amphitheater. It was built in 4th century BCE and is in the heart of the forest. This 1400 seater is a part of much larger sanctuary and has incredible acoustics. Words whispered from the beaten earth stage can be heard high up among 54 tiers of seats. Pure blue water welcomes us while approaching Agistri island. It is quite a small, but very green island. There are only three small settlements, but we aim to find a wild bay and raft the yachts together there. As there is not much light pollutions we sleep under the blanket of stars and clearly visible Milky Way! It`s time to relax, cook and share meals, enjoy music, do some night snorkelling and simply enjoy being in the wilderness. Everyone and everything becomes quiet and peaceful when the sun goes down while you still sail. Magic. You can use one of the lines attached to the top of the mast to swing out of the yacht to dive into the water! A long line behind a yacht and a bunch of people holding onto it. Exciting and refreshing! Remember to bring your ABC snorkeling set. 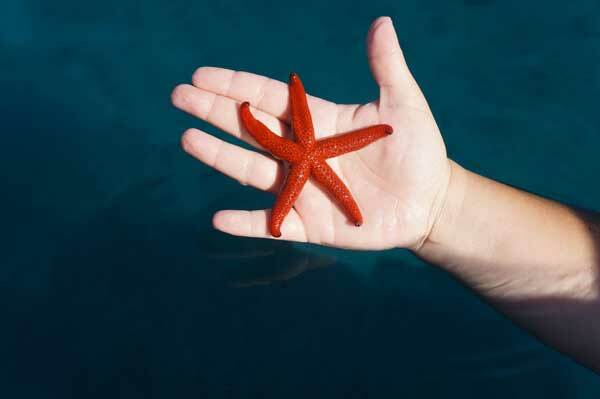 Greek coast if full of marine life! Everyday we aim to stop at vibrant bays for a quick lunch and snorkelling. We drop an anchor and enjoy the beauty of the nature around us. We eat what we cook on board, swim in crystal clear water, sunbath and relax. And if you wish to, you can climb the mast to take such a great photo! Afterwards another sailing session awaits! We always have a regatta on Friday, the last day of our sailing in Croatia. We put our newly learnt skills into use and you take the reins. Skippers do not help at all and the team has lots of fun and a little prize at the end! 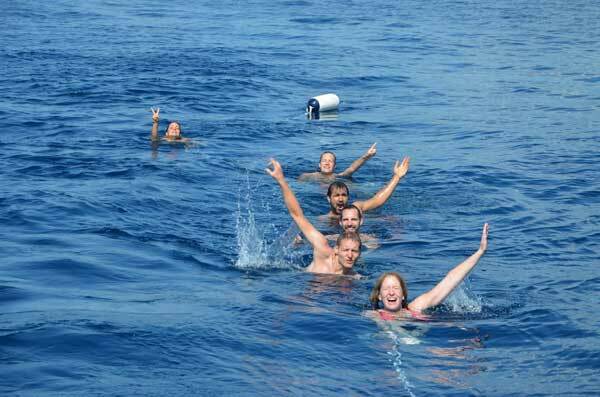 Join us in Greece for flotilla sailing holidays! We respect your privacy. No spam guaranteed. Success! We will notify you when we will be planning a new sailing trip. WHAT DOES THE EXACT ITINERARY LOOK LIKE? At Naleia we plan as we go according to the weather conditions and all crews` moods. There are a variety of places that we can visit, but the order and exact choice is only made each morning after verifying the weather conditions. Leave planning at home! We live for the moment! WHEN CAN I CHECK-IN ON THE FIRST DAY AND WHEN DO WE ARRIVE TO MARINA ON THE LAST DAY? Check-ins are always on Saturdays at 16h00. You are naturally most welcome to come earlier and say hello! Our yacht will be being cleaned at this moment, so we will need to wait a little. We leave the port next morning (Sunday) after breakfast. On Friday, the last day, we arrive at our marina in the afternoon: 15h00-18h00. We need to check-out and leave the yachts before 09h00 on Saturday morning. HOW MANY YACHTS WILL BE IN GREEK FLOTILLA? There won`t be more than 6 yachts in our Croatian flotilla. This allows us to fit into small and uninhabited bays, moor at little restaurants and it makes the group small enough to have a cosy and friendly atmosphere that allows spontaneous ideas to come to life! For example: hiking the nearby hill to admire the sunset, going to a local concert or jamming on our yachts!